Dramm has partnered with CleanGrow to offer their ion measurement tools to the horticultural industry. With one simple Bluetooth LE connected meter, you can measure up to six different elements in a solution. 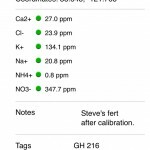 CleanGrow's Nutrient Analyzer offers the ability to measure the precise amount of Calcium, Chloride, Potassium, Sodium, Ammonium, Magnesium, and Nitrate in your irrigation water, stock tank or leachate. 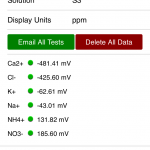 The multi-ion probe can be configured to measure only the ions you select. Choose up to six of the sensors you would like in the probe before ordering. * Simultaneous calibration of all six sensor in less than 60 seconds. 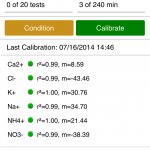 * Fast readouts of all six nutrient ppm values at once in 30 seconds or less. * An intuitive iOS App for use on the iPhone, iPad or iPod that connects via Bluetooth LE. * iOS App as a free download. 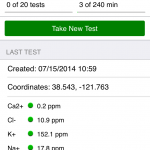 * Ability to record and review date, time, location, coordinates and notes for each sample. * Emailed results in excel format. Contact us via email or at the numbers on the left for more information on our CleanGrow Meters. 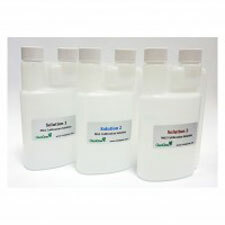 The Full Solution Kit includes the probe, with up to six ion sensors, a reference electrode, calibration solutions, a carrying case, conditioning, DI and sample bottles. 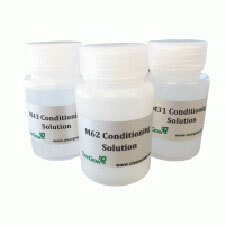 100 ml bottle of conditioning solution for maintaining and cleaning the probe tip. Our unique multi-ion calibration solutions allow for the simultaneous calibration of the multi-ion probes. We custom make the calibration solutions to match the samples you are measuring. The closer the calibration solutions are to your sample range, the more accurate the probe will be.